The Saarinen Low Oval Coffee Table is an iconic oval-shaped modernist table with a pedestal base inspired by the natural sculptural shape of a drop of viscous liquid. Designed by Eero Saarinen in 1956 in an effort to simplify the legs of the common household table, the Saarinen Low Oval Coffee Table has a height of 15.25” | 38.7 cm, length of 42.25” | 107 cm, and width of 27.5” | 70 cm. The pedestal is made of cast-aluminum and supports a range of tabletop options from solid marble, to wood veneer or laminate finishes. What is the Saarinen Low Oval Coffee Table? The Saarinen Low Oval Coffee Table is an iconic oval-shaped modernist table with a pedestal base inspired by the shape of a drop of viscous liquid designed by Eero Saarinen (1956). 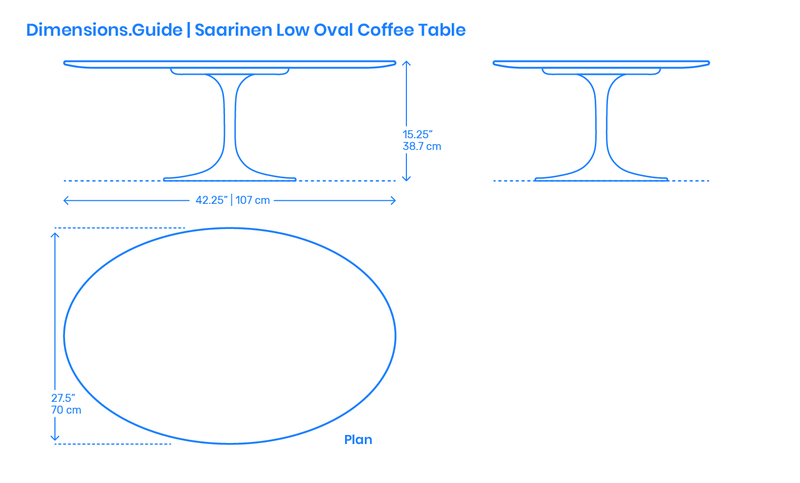 How big is the Saarinen Low Oval Coffee Table? The Saarinen Low Oval Coffee Table has an overall length of 42.25” | 107 cm, width of 27.5” | 70 cm, and an overall surface area of 6.3 ft2 | .6 m2. What height of sofa should be paired with the Saarinen Low Oval Coffee Table? The Saarinen Low Oval Coffee Table has tabletop height of 15.25” | 38.7 cm and should be paired with sofas with similar seat heights between 15.25”-17.25” | 38.7–43.8 cm.